Speed, bonny gardener, like a bird on the wing... over the sea to Skye. 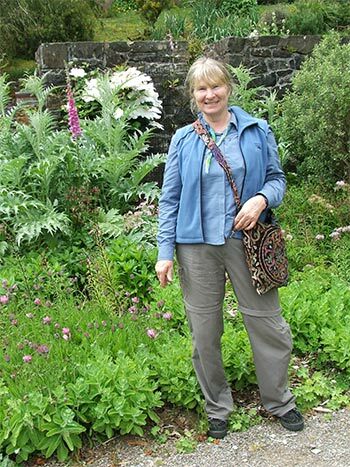 That's the Isle of Skye in Scotland, where I recently visited two wonderful gardens. And there's a bridge, too. 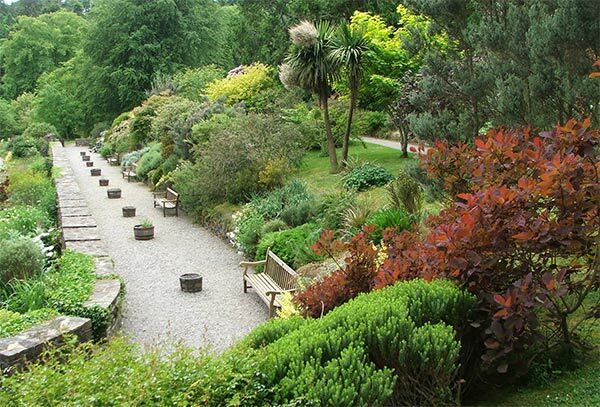 Firstly I went along the coast road to visit the gardens at Armadale. Armadale is near the car ferry terminal, which takes intrepid drivers to Mallaig on the mainland. 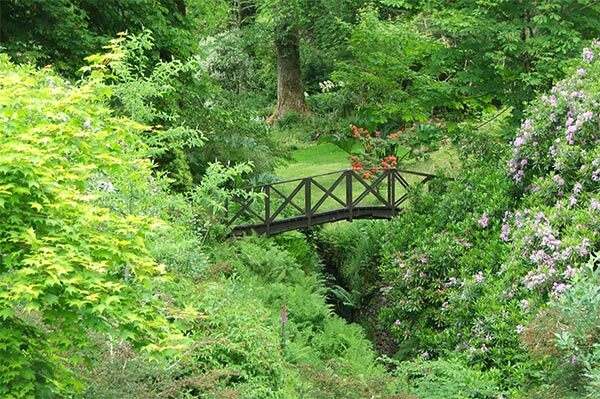 It is the seat of clan Donald, and has gardens, a cafe and museum, and a ruined castle. I walked up Lord MacDonald's drive past a huge flowering Olearia macradonta, native of New Zealand, and over a deep gully full of ferns, Gunnera, and clumps of Dalmera. So far, everything looked normal for a West Coast of Scotland garden. But a signpost looked promising, pointing to a castle ruin, a laundry ruin, and ponds. I didn't notice the 's', and so I thought I'd try the pond (singular) first, mentally preparing myself for a Monet bridge and some large lumpy Gunnera plants. Little did I realise what was in store. Suddenly, amazement, wonder, excitement - the entry in my notebook, underlined, in upper case letters - THREE PONDS!!! 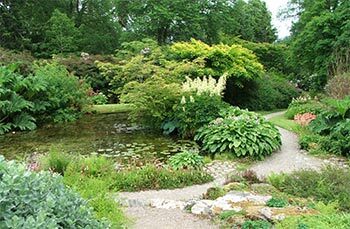 Armadale has three beautiful ponds, side by side, but on slightly different levels, water flowing between. 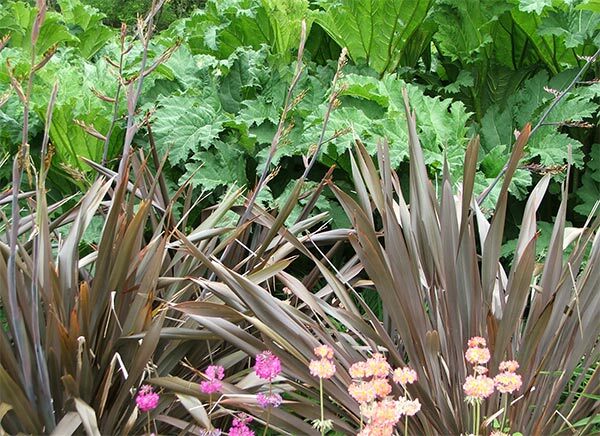 One was fringed by fluffy Astilbes, and I loved the hostas and a beautiful maroon-flowered thistle perennial planted alongside. The upper pool even had a rockery. These three ponds together formed the most perfect water feature that I've ever seen. Hmm... Now that's something to think about in my own garden back home! I learnt something interesting from Armadale, concerning weeds and so-called wildflower meadows. Here I saw my first really weedy border, full of tall grass stalks, dock weeds, campion, Euphorbia Griffii, blackberry, and the odd flax. The trick was in the edging - a neatly mown strip beside the path. I found yet another weedy area, again with a mown edge. This looked awful - until I saw the sign saying 'Wildflower Meadow'. Ah! So that's what's happening. Instantly forgiving the messy look, my thoughts zoomed to the Moosey garden, snoozing in the wintry depths of New Zealand. 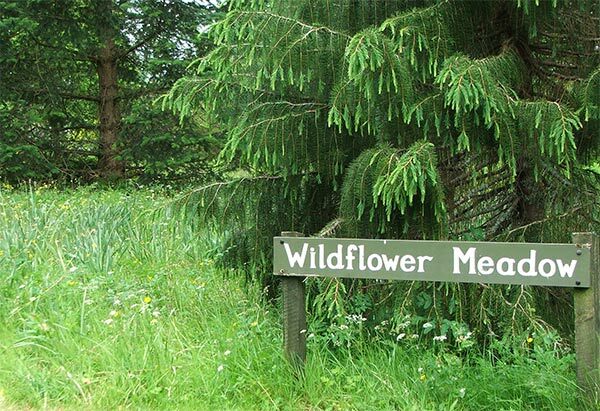 I could erect evocative signs - like 'Wilderness Weedery' - and get away with all sorts of gardening nonsense! 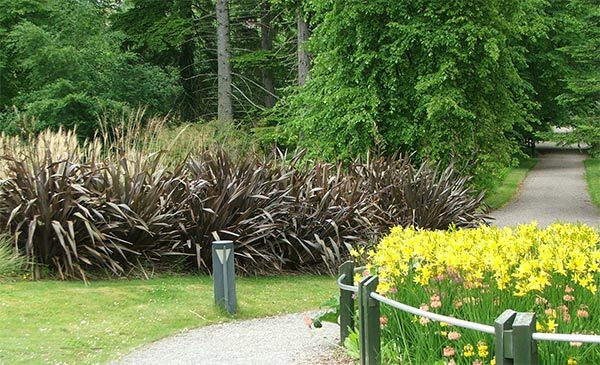 Bronze flaxes (Phormium tenax) were the New Zealand native in vogue in Armadale's gardens. I found a thick row of them near the self-catering cottages, as well as many solitary no-friends specimens in the larger borders. Many were surrounded by fussy apricot primulas - an interesting combination! But flaxes were definitely becoming old hat for this well-experienced garden visitor. My camera was full of photographs of flaxes in Scotland - how about finding something different, like the romantic old castle? I found some ruins up some steps, but they were disappointingly small. No problem - this turned out to be just the castle laundry. And I've got a Laundty Garden back home, so I can relate to this cute little garden room, with pots of hostas and ferns. But back to the signpost I went, to find the correct path to Castle Armadale. Would I have enough room on my camera for photographs of the actual castle? I found it easily - what a beautiful place! 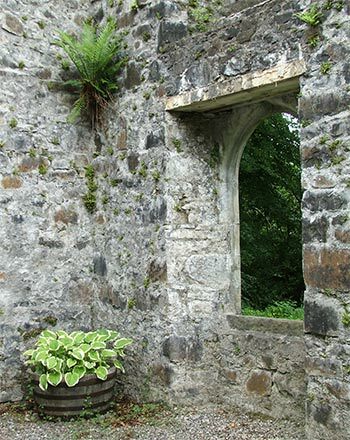 The castle ruins have been incorporated into the garden, with gravel paths, beds full of roses, maples, hostas, flaxes, stachys, and bergenias. Original castle rooms have been transformed into garden rooms! 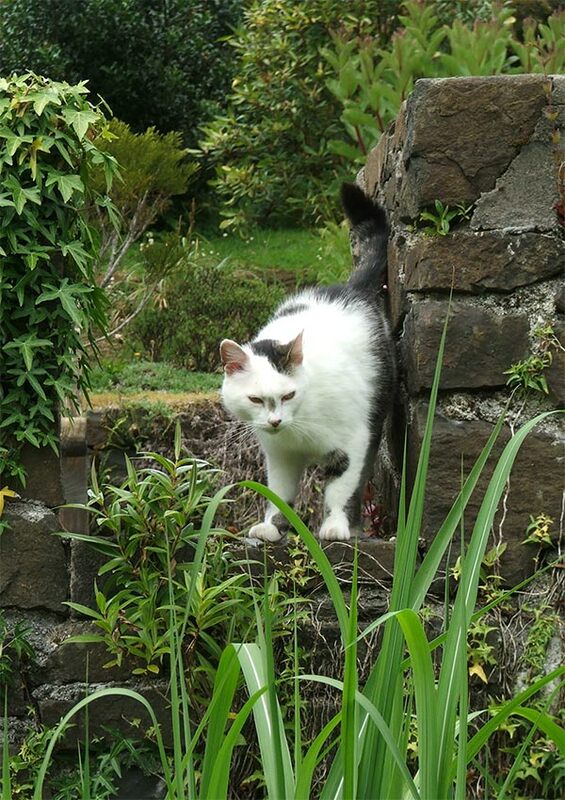 And I met a black and white castle cat, sitting on one of the outer crenulated walls. I took lots and lots of photographs of him. Oops. 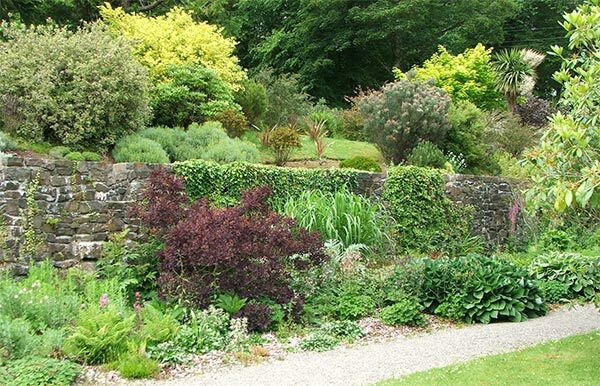 Against one of the castle walls a wide border has been richly planted with a mixture of perennials and shrubs. Red Cotinus, Viburnums and golden-leafed Spiraea took their places alongside traditional flowers, like Astilbes, foxgloves, and maroon thistles. The view of the borders from above was wonderful. A kind visitor took my photograph in front of the walls, just before my camera card ran out. Blast! If you're anywhere near Skye - definitely head for Armadale - you can go over the sea by ferry, or by bridge. Take a spare camera card, though, because you'll take heaps of photographs.